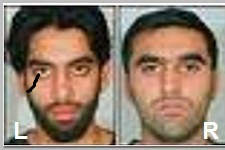 Hassan al-Mandlawi (L), 32, and Al-Amin Sultan (R), 30, both Swedish nationals, were found guilty in Swedish court, on Monday 12/14/2015, of murders carried out by Islamic State militants in Syria in 2013, which were filmed, and sentenced to life. Al-Mandlawi was born in the Iraqi capital Baghdad and came to Sweden as a child in 1991. He was granted, according to the Swedish tax agency population register, Swedish citizenship the same year. Al-Amin Sultan is a 30 year old immigrant from Barca in southern Ethiopia. Although, he moved to Sweden as a child in 1987 and also became a Swedish citizen as quickly. Al-Mandlawi & Al-Aminn Sultan had denied the charges and will appeal the verdict, their lawyers said. The court in Gothenburg, south-west Sweden, was presented with footage of the murders that was discovered on a USB stick in Sultan’s home. The two defendants are heard giving directions in Swedish. One prisoner is beheaded, the other has his throat cut. The court found the duo had actively taken part in the murders, though they did not hold the knife. It also ruled it had been proven that the pair fought in Syria during the spring of 2013. The case against the pair is the first time that a “terror crime” – as opposed to “crimes against international law” have been staged by a Swedish court, Radio Sweden reported.In order to secure a conviction for a “terror crime”, the prosecution must prove that the intention was to cause fear among others. The defence argued that pictures of him posing with weapons were taken when he was in Turkey and Syria doing volunteer relief work. His accomplice, Al-Mandlawi, uses a wheelchair after being shot while allegedly working abroad as a sniper and has suffered brain damage, Radio Sweden quoted his lawyer as saying. Gothenburg, in western Sweden is, per capita, the European city from which most people have joined Islamic extremist groups, according to Swedish integration police chief, Ulf Boström, on 11/15/2015. Previous statistics from the Swedish security service, Säpo, suggest that just over 300 Swedish nationals have left the country to travel to fight with Islamic extremist groups in Syria and Iraq. 40% of those – around 120 young men – are from the Gothenburg area, primarily from Bergsjön and Angered. 11/2015 – SWEDEN COULD COLLAPSE ! !